Few sectors, if any, have evolved at a pace to rival that of electronics. This applies not just to the evolution and advances of technologies themselves, but also to the marketplace. As emerging countries make in-roads into the market, dynamics shift and competition intensifies. As a result, the commercial imperatives to shorten development cycles, deliver more innovative products and offer better service at lower prices become more critical year on year. Gaining competitive advantage depends on small margins – Lean can deliver significant savings and pave the way for substantial and sustainable growth. 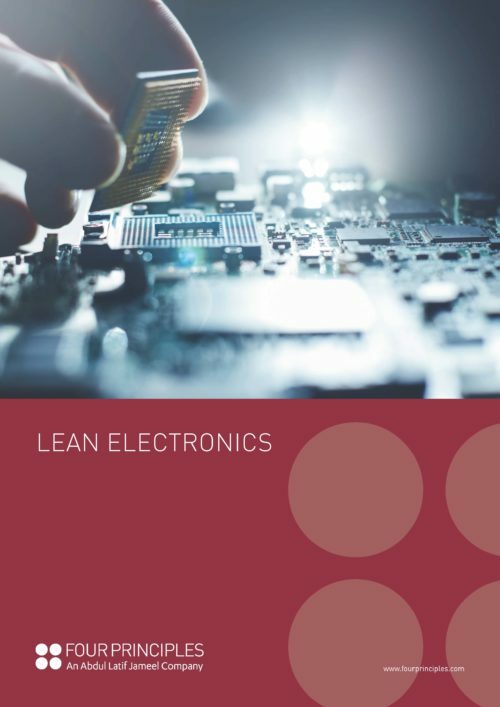 Whether a company operates in OEM or consumer market products, the starting point for Lean is the same. Just as in all other sectors, the key is to identify what represents value to the customer. Everything else is waste. This is especially important in the electronics sector, where the drive to gain product differentiation and USPs can cloud the design process. Designing features and capabilities that the customer neither needs nor wants achieves nothing, other than lengthening R&D and production times, driving up costs and diminishing profitability. Instead, empowered by the clarity of Kaizen, Lean focusses on delivering highly focussed products that the end user actually wants, shorn of waste and unnecessary features. Four Principles’ work encompasses every stage of the production process – from new product development and increasing output to reducing inbound and outbound logistic costs to redefining the distribution network. Leaving no stone unturned, Lean optimises the entire life cycle, embedding quality and designing sustainable assembly processes from the outset. The result? Electronics products that not only offer the right specification, the right features and at the right price, but do so faster and more efficiently than those of their competitors.